Schools sometimes ask us for multi-display video walls and our answer is yes, anything is possible, but think about the content. Let’s take a look at the excitement a bigger video wall can bring to your school and the practicalities of making it work. A big screen is no doubt one way to attract attention. Creating a wall of moving images will draw viewers in more than a static display wall and being digital means it can be updated constantly and direct from the classroom. A multi-display solution can work with the same content as a single display, but as it is bigger and typically in a showcase area for a school the content needs to look really good. With TrilbyTV now supporting 4k video resolution in version 4.2 and later of our Player apps, the quality of content is no longer an issue. With current mobile phones now able to capture in 4k and popular editing tools like iMovie supporting this size, there is no reason why you can’t introduce a bigger video wall in your school and have great looking video content. Connecting to multiple screens can be an issue, and a simple solution to match TrilbyTV comes in the G4K Pro video wall controller from Seada based in Redditch. The G4K Pro is a standalone box with one HDMI input and 4 outputs so you can connect 4 screens. The clever software built into the box does all the work of scaling up to fill the screens. If you choose to, you can be creative with the screen layout and the built-in web interface allows you to set the position, rotation and other variables like bezel size. Once set up there is no need for any further management, all you have to do is think about your content. For more than 4 screens you can daisy chain the G4K Pro box to another and keep doing this to provide the required number of outputs. 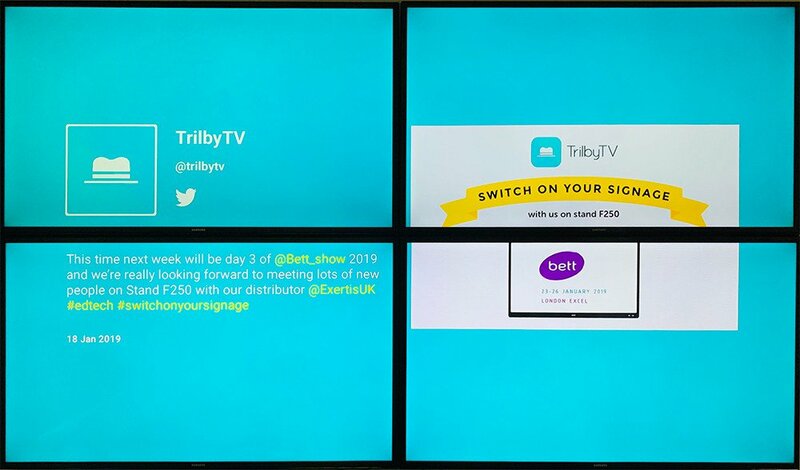 Content already added to TrilbyTV including twitter feeds, slideshows and web content all work just like on a single screen, here it is just bigger! Adding 4k video to TrilbyTV is the same as adding a normal video clip, just click the Add button, choose video and upload. You will need to turn on the 4k video option in the System Dashboard and also set the Player to show 4k. In the Seada offices, we set up a Venz v10 Android based 4k player and instantly had playback on 4 Samsung Full HD displays. The image is crisp and bright and there was no noticeable lag between content appearing on each of the screens. Talk to your IT reseller now about the Seada G4K Pro, suitable screens and a TrilbyTV subscription to start showcasing on your big screen with the number one signage solution made for education. You can get a 30 day trial of TrilbyTV at www.trilbytv.co.uk/trial and find out more about the G4k Pro on the Seada website. Previous post Previous post: Announcing – Announcements!